In this picture I'm with the beautiful Cristina Ottaviani in front of the Colosseum in Rome, Italy. (Sorry guys, she's taken. And not by me). This was at the end of a 2-week ride tracing via Appia, the Appian Way, ancient Rome's highway that crossed half the length of Italy from Rome to Brindisi. I can't even tell you how much fun it was, the amazing food I ate, all the times I followed muddy trails through the forest to find old Roman ruins, the wonderful people I met, the food, the wildflowers sparkling on the meadows, lots of great food, all the things I learned about people and history and human nature, and all the amazing food, especially gelato. Nothing beats Italy cycling tours. And did I mention the food? Anyway, I'm not saying all this to make you jealous, but hopefully to inspire you to be part of a much bigger adventure. One of my dreams was to bicycle around the entire Mediterranean on a bicycle before I turn 40. I've still got a couple years, but now I'm probably going to postpone the trip to take advantage of some new business opportunities, and wait for (hopefully) the current wave of violence in the Levant to blow over. 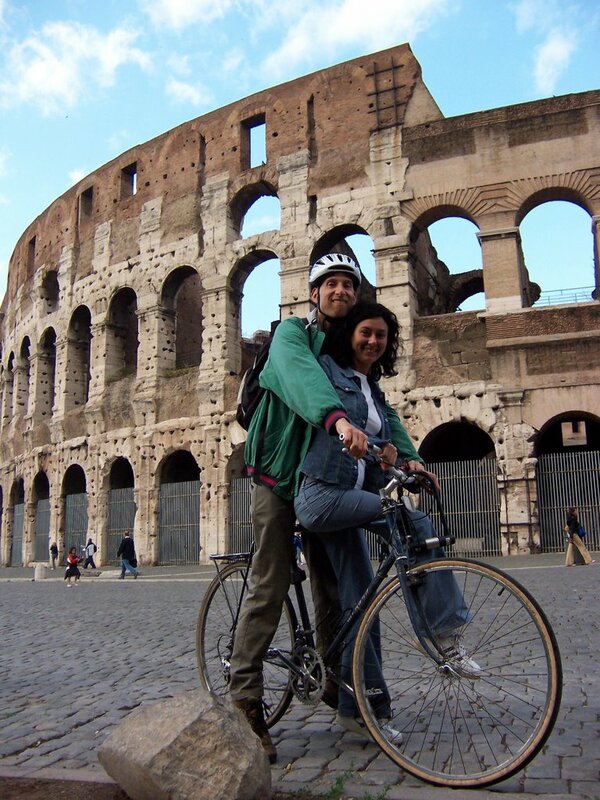 But in the meantime, I'm bicycling across Italy again in the spring of 2008. If you've ever thought about taking a bicycling tour of southern Italy, this is going to be a blast! I'll be posting more information as the date gets closer, or you can leave a comment and I'll email you if you just can't wait to hear more. As far as the Mediterranean bike tour, we've got a few more years to plan, organize, get in shape, and above all dream. I say "we" because if you're actually reading this blog you may have some interest in coming along. Either for the whole ride or any part of it that fits your dreams and your calendar. Leave a comment if you want to ride. I wanted to see if I could do it, and I found out I could. I had a business meeting in Newport Beach, probably a good 30-40 miles away. But it was early morning, and most of the route was along the ocean, so I figured I could bike there without being cooked by the heat. • I brought a change of clothes, and when I got to Newport Beach I put these on and “freshened up” in the restroom of a Starbucks. • This meeting was a casual brunch, so I didn’t need a suit and tie. I got there early. I was all pumped up with endorphins, and amazingly relaxed. This is unusual when I'm going into a situation where I need to impress people. The ride home was harder, because I was tired and had a strong coastal headwind slowing me down. But I took a few dips in the ocean along the way, and had time to brainstorm on some of the issues that came up at the meeting. The lesson: There's nothing like the rush of trying out something radical. Most people gladly go out on the weekend for a bike ride on the beach. But when there's work/money connected, it's more comfortable to retreat to the haven of your car. And there's a lot to be said for air conditioning. I challenge you to try riding your bike somewhere that you have to go. You could revolutionize the world. It's a great way to be healthier and more relaxed, not to mention all the money you'll save on gas.